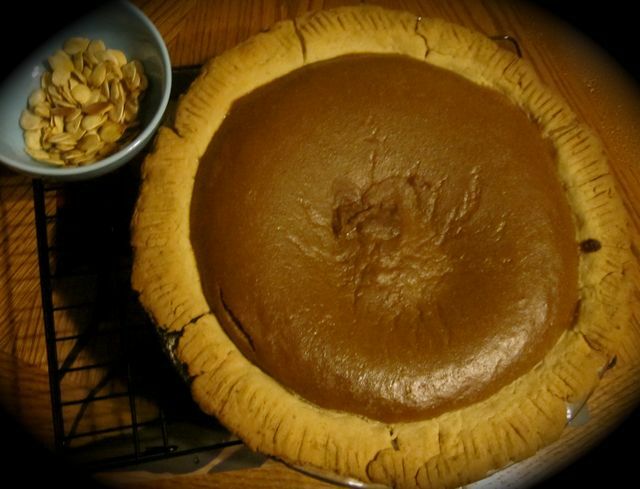 ecokatLA: The Supreme Pie Makin' Pumpkin! The Supreme Pie Makin' Pumpkin! Several months ago I went searching for an heirloom pumpkin that had the best qualities for pie making. I kept coming across a variety called, Winter Luxury. I purchased a seed packet from Sustainable Seed Co. I was really anxious to plant this new heirloom varitey in our small edible home garden not only because of it's taste but also for it's size. We don't have ample space to grow big ole pumpkins. That's one of many reasons why I love heirlooms. They seem to cater more to the home gardener especially in regards to space and flavor! Here she is in all of her Beauty! One of several. She made a little over 2 cups of pulp. 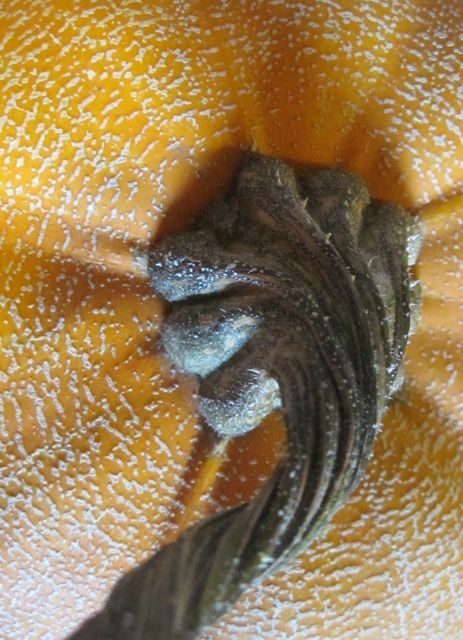 The Winter Luxury Pumpkin requires about 95 to 105 days to reach full maturity. They can be anywhere from 5 to 7 pounds, which is mostly flesh. While they are growing they will have a green exterior that changes to yellow and orange with a nice overlay of beige netting. Since this varitey grows like a vine, it would be neat growing them on a trellis next year to save more space. A healthy plant will yeild 3 - 4 pumpkins per vine and they are great keepers. This is a classic pumpkin indeed! It was introduced by Johnson & Stokes in 1893. 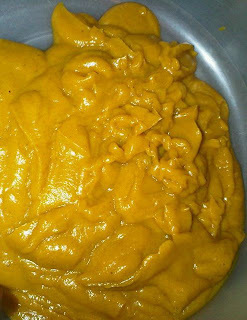 At that time the pumpkin had a more yellow pulp. In the 1920's the Gill Brothers of Oregon re-introduced the variety with an oranger pulp. I've also read that this is Glenn Drowns favorite pie pumpkin. He is the Vine Crop Curator for the Seed Savers Exchange. 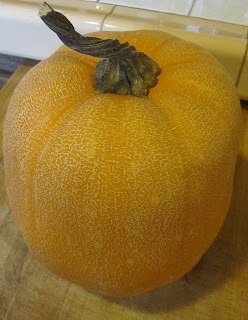 Beautiful netting almost like a muskmelon. So guess what I brought to Thanksgiving dinner? Yup, you guessed it, Pumpkin Pie! I sliced that pretty pumpkin, removed the seeds, and placed the slices in the oven at 400 degrees. 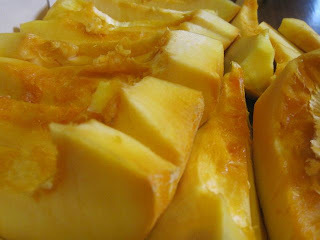 I seperated the seeds to roast them and then used the stringy core pulp for a facial scrub. While the pumpkin was roasting away I gave myself a luxurious pumpkin facial with the left over immature seeds and stringy pulp. 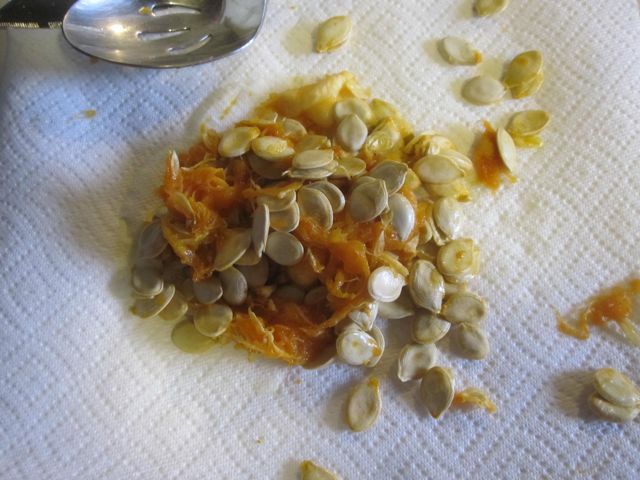 The immature seeds act as an extra exfoliant and the pumpkin stringy pulp from the core contains lots of vitamins! Vitamin A, vitamins E and C, salts and minerals, carbon hydrates, and proteids are found in the pulp. The pumpkin's core contains lecithin, tyrosine, peporesine, phosphorus and vitamins B and A. My skin felt so smooth after this easy all natural treatment! Another cool thing I stumbled upon which I was totally unware about was the medicinal properties of pumpkin seeds! Some of the theraputic benefits of pumpkin seeds are; support in eliminating intestinal parasites, cleaning of the blood vessels, stimulating kidney activity and adjusting cholesterol levels. I've read that you get more of these health benefits if you eat them raw as opposed to roasted. Soon after my refreshing facial the roasted pumpkin slices were ready to be blended! 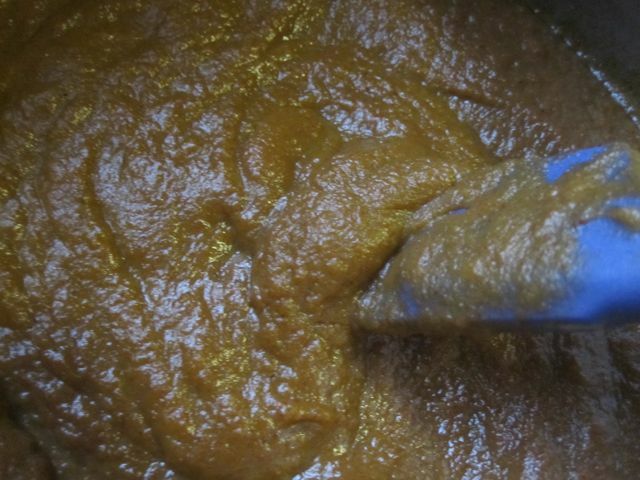 Take those gorgeous roasted pumpkin slices out of the oven to let them cool for about 15-20 minutes, remove the skins, place in blender or food processor, hit start, be patient, and also be ready for a luxurious pumpkin puree. Now time to add the sugar, spice and everything nice! Blend together and then place on stove top to melt brown sugar along with those intoxicating spices. Of course, all of this pie filling preparation is done after you have made your pie dough. 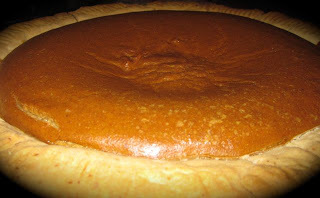 At the very least, make sure the pie crust is ready to go before putting your pumpkin pie mixture on the stove top! Final mix will have a nice sheen to it. Add your final ingredients and then fill your pie crust. For my pie filling I used a recipe from The Delicious Life Blog which provides you with a Cook's Illustrated recipe. I used my own crust recipe which came out too salty, next time I will try a graham cracker pie crust recipe instead. However, the pie filling itself was the best I have ever had and others agreed. Don't forget to whip up some real whip cream by using heavy whipping cream, vanilla extract, cinnamon, and powdered sugar for sweetness. A Real Winter Luxury Pumpkin Pie. The way Pumpkin Pie is supposed to taste! Close up of the Pumpkin Pie goodness! We are thankful for the many lessons that the Pathway to the Garden has taught us this year and we are thankful for our Organic Homegrown Winter Luxury Pumpkin Pie! A new tradition that we plan to keep by saving these wonderful seeds, it's hard not to eat them all up!